With the economy being in the state that it is, increasing numbers of homeowners are opting to update their existing homes rather than relocate. Oftentimes, the basement is the area where homeowners will invest much of their time and energy, so you'll need a few basics when you're deciding on your new bathroom. If you have the space to spare, consider adding a small shower stall to your new bathroom. With a bunch of people in your home, it is very convenient to have an extra shower around. Keep it simple and tuck it into a corner of the space to ensure that traffic flow isn't obstructed. When the toilet is installed, you should have a better sense of what kind of bathroom vanity you can use. Since this is a smaller room that won't be used all the time, consider going with a simple pedestal basin - this will give you plenty of space to incorporate additional shelving and medicine cabinets. You have a blank slate to work with in your new bathroom, so experiment to find the perfect combination that works for you. 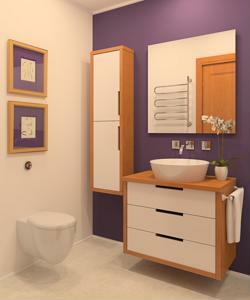 What suggestions do you have for homeowners designing a basement bathroom?